Hi there. We are Tom and Stacy, owners of SandnSol. We fell in love with Destin the first time we stepped foot on the beach, and we knew we wanted a second home here. 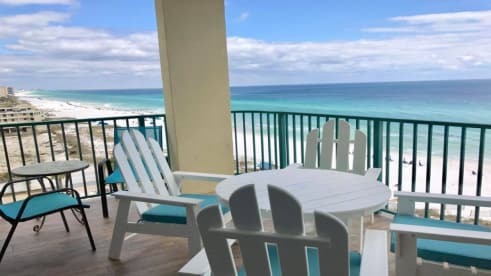 After several visits, we found the perfect place, and now we love to share our condo and our love of Destin, with family, friends, and travelers alike. Destin’s sugary white sand beaches along the Emerald Coast are like no other place we’ve been. We work hard to create a wonderful vacation home for you. Our condo is centrally located to everything in Destin. On the beach side, we have private beach access and beach side pool/spa; all things related to sand and waves. On the street side, we are close to many restaurants, shops and activities. Spend an early morning with coffee on the balcony watching the dolphins, or take a walk down the beach looking for shells. Build sandcastles and just kick back, or venture out to shop, play mini golf or partake in one of many excursions available in the Harbor Village. Just imagine the fun you can have at SandnSol and Destin, which is consistently rated as one of the most beautiful beaches in the world. It means sand and sun. Chosen as a play on words because it epitomizes everything about the Salt Life. Sand and Sun are good for our soles as well as our souls!